Inadvertent lesions of the intraabdominal organs and vessels caused by trocars and Veress needles are rare but serious complications of laparoscopic surgery. Establishing the pneumoperitoneum is believed to be the most dangerous step. The Swiss Association for Laparoscopic and Thoracoscopic Surgery (SALTS) prospectively collected the data on 14,243 patients undergoing various standard laparoscopic procedures between 1995 and 1997. This database was investigated with special regard to intraabdominal complications caused by trocars and Veress needles. There were 22 trocar and four needle injuries (incidence, 0.18%). Nineteen lesions involved visceral organs; the remaining seven were vessel injuries. The small bowel was the single most affected organ (six cases), followed by the large bowel and the liver (three cases each). All vascular lesions, except for one laceration of the right iliac artery, occurred as venous bleeding of either the greater omentum or the mesentery. Fourteen trocars were inserted under direct vision. 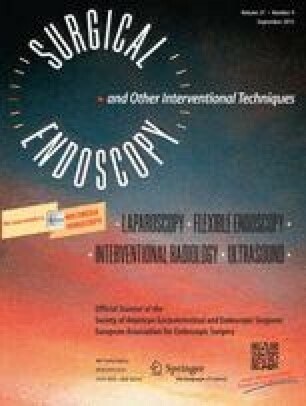 Nineteen trocar injuries were recognized intra-operatively; diagnoses of two small bowel and one bladder injuries were made postoperatively. Needle injuries were all diagnosed intraoperatively. Only five injuries could be repaired laparoscopically; the remaining lesions were repaired openly. Four patients underwent an open reoperation, and another patient needed five reoperations. There was one death (4.0%). Trocar and needle injuries are rare complications of laparoscopy. However, if not recognized intraoperatively and repaired immediately, they induce increased morbidity and mortality. Both open and closed establishment of the pneumoperitoneum are related to a potential danger of perforating lesions, but inserting the first trocar under direct vision allows early recognition and immediate repair.